Lisa and I met Mike Matucheski, the master cheesemaker from Sartori at the New Longo’s in Leaside. Mike guided us through a tasting of his award winning BellaVitano cheeses , we tasted the Raspberry, Balsamic and Merlot along with his relatively new Rosemary & Olive Oil Asiago. It is always inspiring to met the cheesemaker and find out what their inspirations are. 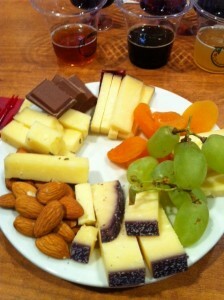 Here a picture of the cheese plate.